Music icon Prince has been posthumously honoured with his own custom shade of purple by officials at the Pantone Color Institute. The Purple Rain hitmaker was often referred to as the "Purple One" thanks to his love of the composite colour, and now global industry experts at Pantone have created the Love Symbol #2 in his memory. 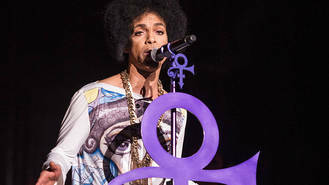 The new hue was inspired by the shade used for his custom-made, signature Yamaha purple piano, which he had planned to take on tour before his shock death in April, 2016. "The colour purple was synonymous with who Prince was and will always be," explains Troy Carter, the Entertainment Advisor to the singer's estate. "This is an incredible way for his legacy to live on forever." "A musical icon known for his artistic brilliance, Love Symbol #2 is emblematic of Prince's distinctive style. Long associated with the purple family, Love Symbol #2 enables Prince's unique purple shade to be consistently replicated and maintain the same iconic status as the man himself." Estate bosses are now in talks with merchandising manufacturers to incorporate the custom colour in new products for fans to buy. The name of Prince's official purple hue is also a nod to the unpronounceable graphic he adopted as his stage name back in 1993, while stuck in a contract dispute with Warner Bros. executives. He later copyrighted the image and named it the Love Symbol #2.